High school and college students in South Texas can earn a scholarship and help spread the word about the need to join the Donate Life registry by making a short video and taking part in the GenCure Tissue Donation Awareness Scholarship competition. Logo for GenCure Tissue Donation Awareness Scholarship competition. 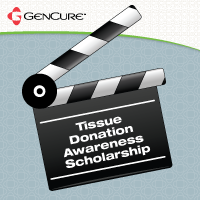 Students interested in video can get a jump start on their education by entering the GenCure Tissue Donation Awareness Scholarship competition. The winner will earn a $1,000 scholarship and have his or her video posted on the GenCure website and social media accounts. The competition begins Feb. 1, and the deadline is May 31, with the winner announced on June 9. The competition is designed to help raise awareness of the importance of joining the Donate Life registry and the importance of tissue donation on people’s lives. It's open to juniors or seniors in high school or college students enrolled for the 2016-17 academic year in certain counties in South Texas. A list of counties is available at GenCure.org/scholarship. An entry should be 2-3 minutes long and made in a commercial/public service announcement format. The goal is to persuade viewers to help others by joining the Donate Life registry. More information about the importance of tissue donation and the registration process is available at GenCure.org/tissue-center. The winner of the scholarship will be selected by employees of GenCure, based on how closely the video is to the topic, its accuracy of information and its creativity. The winning video from 2016 can be seen on YouTube at this link. For more information, visit GenCure.org/scholarship, send an email to scholarship(at)gencure(dot)org or call 210-731-5566.